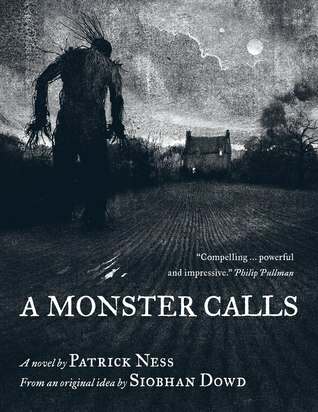 A Monster Calls is an extraordinary book that I simultaneously want to talk about and keep quietly close. It was recommended to me by a 6th grade teacher. It has become one of my most prized, in a precious-hold-it-in-your-heart-forever way, reading experiences. It is definitely a book for older readers (probably junior high and above) as it touches on emotions and circumstances that can be doubly scary if you haven’t yet had them enter your life’s experience. Conor is a teenage boy whose mother is undergoing chemotherapy for cancer. And it does not appear to be working. At exactly 12:07am each night the yew tree in his backyard “goes walking” into Conor’s home and his life. The tree tells Conor he will tell him 3 stories and then Conor will tell him the 4th. Conor is skeptical. He tells the Tree he is not frightened of it. Conor encounters a much more terrifying monster in his recurring nightmare. The Yew Tree pales by comparison. Conor’s nightmare, his contentious relationship with his maternal grandmother and the visit from a father who abandoned him years ago in favor of a new wife and child across the ocean in the U.S. meld with Conor’s nighttime experiences with the Yew Tree. The reader’s interpretation of which monster (or monsters) are real physical beings and which are representations is completely open and each will view it differently. I was deeply moved by Conor’s struggle: his conflicting anger, guilt, grief and tenderness. I was with him seeing and feeling through him at every moment. Conor’s pain is palpable but never written with the sole purpose of twisting the reader’s heart into a knot simply for the sake of doing so. It is a shared opportunity to give voice to the thoughts and feelings for which we either don’t have the vocabulary or the strength. It is reassuring–knowing someone else may be feeling or thinking the same as we are–without judgment. A Monster Calls is one of those rare reading experiences that transcends the words on the pages and has the potential to be life-changing. I read another reader’s review in which she expresses her gratitude for sharing ALL the sides of grief. Read A Monster Calls for your soul–whether for healing or empathy. It will add to the core of your being the way the best stories do.